Last month, the students of the International Master in Management had the opportunity to visit the beautiful city of Trieste in Italy for the annual international business trip. We had some amazing experiences, from coffee to wine and from kitchens to furniture. On the first day we were introduced to EADA’s partner MIB School of Management at the mystical Ferdinandeo’s Palace, where they explained the different activities and company visits we would have during our one week stay, which also included a final group presentation on the last day about how to do business in Italy. 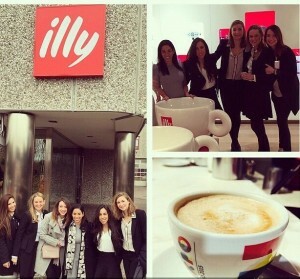 During the following days, we visited prestigious companies such as Illycaffé, the wine producer Castello di Spessa, furniture maker Calligaris, and kitchen manufacturer Snaidero; all of which helped us to learn more about their strategies within different sectors in the Italian business world. We also had a meeting in the City Hall of the Municipality of Trieste, where we had the honor of having a member of the Board of the City Hall welcome us and teach us about the history of the city. On our last evening, we had a Football Challenge between MIB and EADA organized by MIB School of Management, where of course EADA won, both in the female and male categories. This was definitely an enriching experience not only culturally but also in terms of how the business world works in Italy. The seaport city of Trieste has an interesting history, mainly due to its strategic position in the northeast part of Italy, which has allowed it to remain as one of the wealthiest regions in Italy. Furthermore, when doing business in the highly fragmented Italian industry, one has to bear in mind that most businesses are run and owned by families, therefore companies with strong strategic moves such as the ones we visited, are the ones that are more likely to survive.